I love small bites. 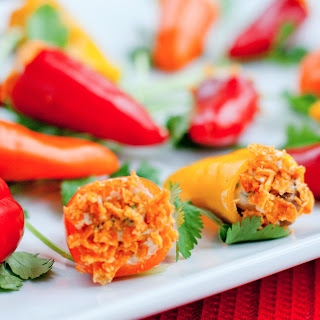 There's something so satisfying with a flavorful appetizer that packs a punch and can be enjoyed in 1 - 2 bites. With the Super Bowl coming up this Sunday, I thought this would be the perfect appetizer to serve your guests. It can be made a few days in advance too - TOUCHDOWN! …too much? I love how the cool, creamy mixture plays with the spicy chorizo. 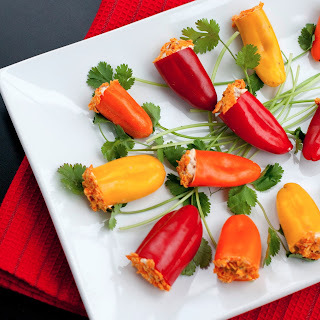 The crispness of the bell pepper and chip crumbs give the necessary crunch factor to the filling. These things are addictive and so easy to make. Plus they're incredibly fun finger food - perfect for game-time snacking. I'm not much of a football fan but I love any excuse to throw a party. Last year I made buffalo chicken wontons, balsamic bean chili, cornbread and to end the night, fresh out of the oven fully loaded cookies and guiness floats. Oh yeah, I had some veggie trays, grapes and chips too. You can never have enough food, right?! What are some of your favorite appetizers for Super Bowl Sunday? In a large skillet, brown your chorizo over medium high heat. You want very small pieces so break it up while it's cooking. While the chorizo is caramelizing and doing it's thing, in a medium bowl, combine cream cheese, corn, green chiles, cilantro, hot sauce and cumin. Give it a good stir until it's well mixed. When your chorizo is done getting brown and flavorful, strain it and place the crumbles on a paper towel. If some of the crumbles are on the large side, break them up. Once the grease is absorbed and the meat has cooled slightly, drop your crumbles into the mixture and give it another good stir. Add in your sour cream, salt + pepper. Place mixture into a piping bag or ziplock bag and set aside. Cut the tops off of your peppers and scrape out any seeds if present. 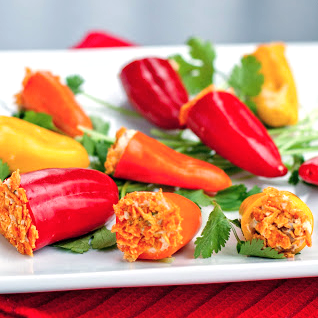 Cut the tip of your piping bag or ziplock bag off and squeeze mixture into your mini peppers. Place in the refrigerator and chill until ready to serve. If adding the chip crumbs, just before serving dip the tops into the crumbled chips and place on your platter. 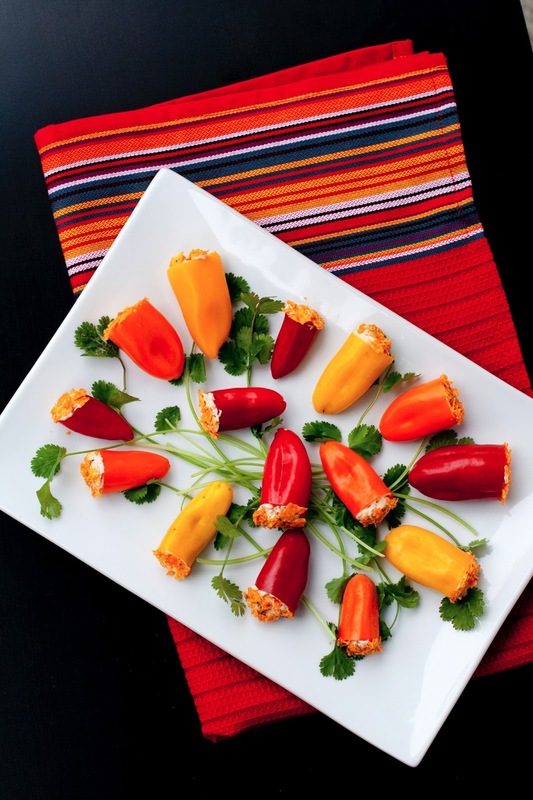 these are mexican inspired bite sized appetizers. think of a jalapeno popper but fresh and less spicy. you can improv any of the ingredients. can't find those mini peppers? use jalapenos OR make the cream cheese mixture as a dip and serve it with sliced bell peppers. you can even make a bowl out of a bell pepper for cute presentation. not down with meat? leave it out and add in some black beans! shredded chicken, chopped bacon, or ground beef would be great substitutions as well. don't have sour cream? you can use a little bit of plain greek yogurt, mexican creme or even a splash of milk. the idea is to thin out the cheese mixture so it's easily piped into the peppers. want to lighten things up? use fat free or low fat dairy products and add in some extra veggies, omit the chip crumbs. Want to go dairy free? Try using mashed avocado to get the creamy consistency with a healthier benefit. really your options are limitless with this recipe! Um, mouth watering so bad right now! Oh what I would do to be at your house for superbowl sunday! I made these the other day. They were so stinking good. I tried to lighten it up with half the cream cheese, and no sour cream. I substituted with 4 oz Greek yogurt instead. I also put in 1 finely diced jalapeno to bump up the heat. OMG the people at my party went crazy over them. Looked really good too with all the colors. thanks for reaching out carole! i added my link to your page. hope you have a wonderful day. Morgan, thank you for linking this in to Food on Friday. We have got a super collection of Mexican dishes. I hope you have stopped by some of the other links to check them out! You serve these cold? have you tried both cold and hot? i've only tried serving them cold. i bet they'd be fantastic warm too but much messier to eat as the peppers would soften and it would no longer be a finger food.